We are busy moms, too. A four hour work shift at a consignment sale feels a little overwhelming for those of us trying to fit it in to caring for our kids, working, sports, housework, church activities, band practice, theater, homework…oh, and date night with Hubby? Seriously? It’s a lot. Being a mom is a lot of work, and Duck-Duck-Goose wants to make your life better, not worse! There are the obvious things, like the fact that we waive most of your participation fee and enter your name into a drawing for a chance to win 100% of your earnings. You also get to shop early. Now, frankly, when we first started this event a few years ago, this wasn’t that big of a deal. The crowds weren’t too big, the line not that long and the deals did not go as fast. So if you came in to shop at the consignors’ sale, you were pretty good to go. But things are different now. The best deals (remember that incredible bike trailer for $25 last fall?!? Or the brand new train table with ALL the accessories that went for $75?!?) go to the workers who get to shop at 11am because they worked at least 3 shifts. And the best half price deals? Those go to the workers with 4 shifts, or those who work a sorting shift, because we really need those workers, and we reward them with the opportunity to shop early on Half Price Day. The bottom line is: when you work at Duck-Duck-Goose, you get better deals. The sale can’t run as efficiently as it does without workers. It’s that simple. We rely on our workers to get stuff done. More workers mean faster checkout, shorter lines, neater racks, cleaner aisles, and better security. Long lines can sometimes mean that people choose to leave rather than wait in line…that means they don’t buy your stuff. Neater racks mean that shoppers can find your stuff more easily. Better security keeps your stuff safer. Workers help us try to match missing tags with their items and get them back on the racks to sell. Without workers, your stuff might sit without a tag, not selling, for longer. Workers make sure your stuff doesn’t stay in the dressing room instead of on the racks. 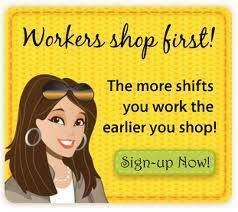 Workers make sure that shoppers can find what they are looking for, which just might be your stuff! The bottom line: When you work at Duck-Duck-Goose, you make the sale more efficient and you sell more stuff. But there are also less obvious benefits to working at Duck-Duck-Goose. One of the things we hear most often from our workers is “Now I get it!” or “So THAT’S why you tell us to do it that way!!”. When you work a sale, you get to see a different aspect of it and you understand the whole process better. Once you work at checkout, you will value barcodes that scan easily, handwriting that is legible, prices and consignor numbers that are easy to recognize. You also see what items sell the most, what prices sell and which ones don’t. Once you work the floor, you will greatly value the description and accurate sizes on the tags, and understand how much work it takes to keep the store neat and orderly. You will know where stuff is, and where to look when you are shopping. You pick up the items that have fallen in the floor, and you remember to make sure your stuff is pinned to the hangers. You match missing tags to items, and you realize that you want to write better descriptions for your own items next time. Spend a little time sorting and you will never forget to highlight correctly again. Work at checkout during our half price sale, and you will always remember to red dot your “No Discount” items, and vice versa. The bottom line is: when you work the sale, you understand how the sale works, and you can be much more efficient at both selling and buying. Another benefit to working a sale is that you get to spend time with people you didn’t know before. This might sound weird, but relationships are a big reason why we do what we do. We believe that God has called us to engage with others in a way that demonstrates Christ’s love and helps encourage them in their journey. We get the opportunity to hear the stories of cool things that are going on in our consignors’ families, as well as hear about opportunities to care for those families who are hurting and struggling. Our workers get to know a little more of that side of things, and it often serves to encourage them in their own efforts as they raise their children. For some, it’s simply an opportunity to spend 4 hours interacting with grown-ups for a change! Our workers often share tagging tips with each other, parenting tips, etc. Best of all, it gives us the opportunity to get to know you better. Knowing who our consignors are, what’s important to them, etc., helps us to remember why we do what we do and how we can do it better. We often get our best advice/suggestions for improving the sale from our workers. The bottom line: Working at Duck-Duck-Goose can help build relationships, and relationships make our lives and the sale better!! We value our workers and each hour they give us is appreciated. We hope you will consider helping Duck-Duck-Goose continue to raise the bar for consignment events in Tennessee, and add a work shift when you consign with us this season! Worker schedule and sign up is online via our website and opens soon after the opening day of consignor registration. Click on the Workers tab and sign up! Join us on Facebook and sign up on our Mailing List to stay up to date on all things Duck-Duck-Goose! Have you recently moved? Changed your email address? Got a new last name? If you would like to see what information we have for you in our system, CLICK HERE. After logging in with your consignor number and password, notice a side link “Update My Account Information” on your Homepage. Click this link to make any necessary updates about yourself. For all of you who dislike waiting in lines, we have a solution for you! while YOU continue to SHOP! to stand in line on your behalf… for a small donation ($10). “Duck-out-of-Line” volunteer… what a great way to give back! they will be able to step aside at the front of the line. When you’re ready, you will be next in line! It’s that simple. NOTE: We are still taking volunteers from local youth groups, charities, or other organizations needing to raise support for their particular cause. Volunteers will receive 100% of the profit from their collections. the more you will be able to collect.